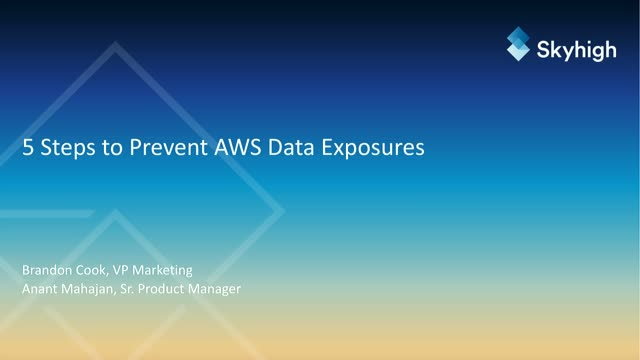 Amazon Web Services has strong security features, but customer misconfigurations have led to a series of very public data exposures over the last few months from Verizon, Dow Jones, Accenture, and Patient Home Monitoring. And now, we are seeing different misconfigurations leading to a new AWS exposure, dubbed GhostWriter, whereby third parties can alter content in S3 buckets, enabling bad actors to use the exposure to conduct MITM phishing and malware attacks. As a senior product manager, Anant Mahajan heads up Skyhigh’s IaaS product for AWS, Azure and Google Cloud. Prior to Skyhigh Networks, Anant led Druva’s Governance product offerings and has a successful track record of driving product innovation in the Cloud Security, Data Protection, eDiscovery and Compliance space. Anant is a software engineer by training and holds an MBA from Imperial College London.